We have covered the use of the BlackBerry PlayBook being utilized by law enforcement several times here on CrackBerry, but today brings us the encouraging news that the Intergraph Mobile Responder application will now get PlayBook support. The application is an extension of the police command centre and will give officers out in the field access to a range of services straight from the QNX powered tablet. As well as cops being able to use the PlayBook to view in real time the details from incident reports, indent updates and emergency requests the app also integrates chat functionality as well as GPS tracking for officer safety. Intergraph Mobile Responder is due to be shown off at the Canadian Association of Chief Police Officers ( CACP) annual conference to he held in Nova Scotia, Canada from August 19th. The news that the application is getting PlayBook support is just another example of how law enforcement can take advantage of the great hardware that RIM have provided with the tablet. We interviewed Constable Ken Koke from the Chatham-Kent Police Service just a couple of months ago and he detailed how the PlayBook has almost revolutionized the the way that officer productivity can be increased. 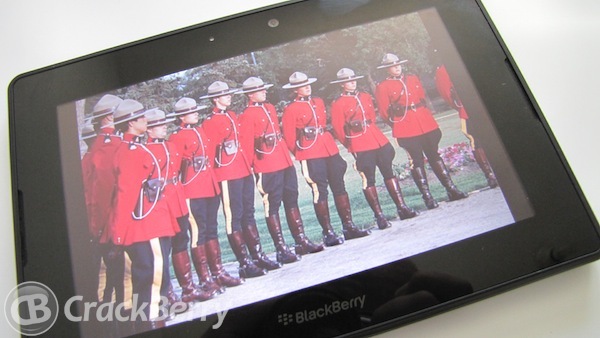 It isn't clear if police officers will be using the new 4G PlayBook or the traditional WiFi model that allows for bridging with BlackBerry smartphones, but I wouldn't be surprised if this announcement has been made today in conjunction with the 4G PlayBook going on sale in Canada. Carry on reading for the full press release. Intergraph® presents the Intergraph Mobile Responder application for the BlackBerry® PlayBookTM tablet at the upcoming Canadian Association of Chiefs of Police (CACP) Annual Conference in Nova Scotia, Canada. Mobile Responder gives police and emergency responders in the field access to Intergraph's Computer-Aided Dispatch (I/CAD) system from a mobile device. Mobile Responder's rich interface allows the transmission of unit status, dispatch reports, incident updates and emergency requests from a BlackBerry PlayBook. The Mobile Responder application extends the power of the command center to remote teams and accelerates critical decision-making and incident management in the field. Interfacing with a BlackBerry PlayBook, field officers can access local police databases in real-time, view event details and interact with dispatch centers to provide and receive incident reports. "Intergraph is very excited about Mobile Responder. It offers the functionality officers need in the field, on the platforms being deployed today," says Mark Patrick, Intergraph's Public Safety Business Development Manager in Canada. "The consistent interface will allow officers to be more efficient, whether deployed in vehicles or on foot." Officers will also benefit from real-time chat capabilities and location verification from GPS tracking capabilities found in the PlayBook. Mobile Responder fosters public confidence with its secured transmission and storage of data found in BlackBerry devices. Police chiefs, field agents and dispatch officers in attendance at CACP will be able to receive personal demonstrations of the Mobile Responder application on PlayBook by Intergraph experts and representatives from BlackBerry-maker Research In Motion (RIM). In addition, Intergraph will also demonstrate its Computer-Aided Dispatch (I/CAD) system that is integral to Mobile Responder. Adding to Intergraph's footprint at the CACP show is the exhibition of a police cruiser outfitted by Darta Enterprises, a contracted manufacturer to public safety agencies. A Darta representative will be in the Intergraph booth with the police cruiser, which will have a BlackBerry PlayBook mounted inside, in place of the traditional cruiser notebook computers. This showcases the emergence of new cruisers where officers will be able to work faster and smarter for their communities. "Utilizing the BlackBerry PlayBook, Intergraph is bringing useful information to the fingertips of law enforcement officers and emergency responders in a fast, convenient, secure and affordable way," said Paolo DeNarda, Senior Business Development Manager, Research In Motion. "This is another great example of how BlackBerry developers are finding new ways to leverage the power of the BlackBerry solution and add significant value for customers." Intergraph will be exhibiting in booths 225, 227, 324 and 326 at the CACP Annual Conference, which takes place August 19 - 22, 2012, in Cape Breton, Nova Scotia. Details can be found online at www.cacpconference.ca. Intergraph operates through two divisions: Process, Power & Marine (PP&M) and Security, Government & Infrastructure (SG&I). Intergraph PP&M provides enterprise engineering software for the design, construction, operation and data management of plants, ships and offshore facilities. Intergraph SG&I provides geospatially powered solutions including ERDAS technologies to the public safety and security, defense and intelligence, government, transportation, photogrammetry, and utilities and communications industries. Intergraph Government Solutions (IGS) is an independent subsidiary for SG&I's U.S. federal business. Intergraph is a wholly owned subsidiary of Hexagon AB (Nordic exchange: HEXA B). For more information, visit www.intergraph.com and www.hexagon.com.